Harley and Sadie (aka Harley Brown and Sadie Lane) are Jared Padalecki's dogs. Rescued from the same shelter, Harley was a mastiff cross, and Sadie who is 13 months older, is a German Shepherd mix (possibly with some dingo). 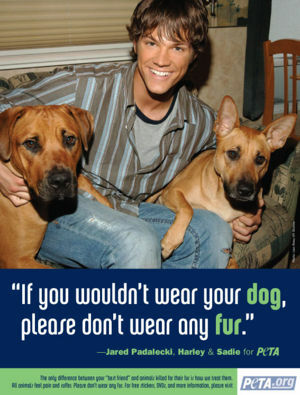 In 2006, Harley and Sadie starred along with Jared as part of an anti-fur campaign run by People for the Ethical treatment of Animals (PETA). On Saturday, November 5, 2011, Jared tweeted that Harley had died, having lost a battle with cancer "Can I have 195000 moments of silence 4 a great dog who lost his battle with cancer today? R. I. P. Harley. We're better for having known you" source. There were many tweets of condolence from fans, friends and crew members. On 3rd March 2016 during a livestream for the one year anniversary of Always Keep Fighting, Jared wished Sadie a happy 13th birthday. On 3rd March 2017 Jared tweeted "Happy Birthday to two things that bring me great joy :) #Happy14Sadie #Happy2AKF #spnfamily". Sadie dressed for Halloween 2011, tweeted by Clif Kosterman. Jared and Harley in Men's Health magazine Nov. 2006. Jared on set with his dogs 2006. Jared with a fan portrait of Harley & Sadie presented at EyeCon Convention September 2008. Jared and Sadie in 2016. Fan fiction featuring Harley and Sadie, and dogs generally. Jared supports the dog rescue service A Dogs Life Rescue. In 2008, fansite SupportSupernatural.com donated $1200 to PETA in Harley and Sadie's name. Jared talks about crying during "Marley and Me".